2018 has arrived and with it the first Friday of the new year. I am determined this year to create more and blog more regularly. This week I worked on some art challenges, as well as create some pieces to prepare for this year. 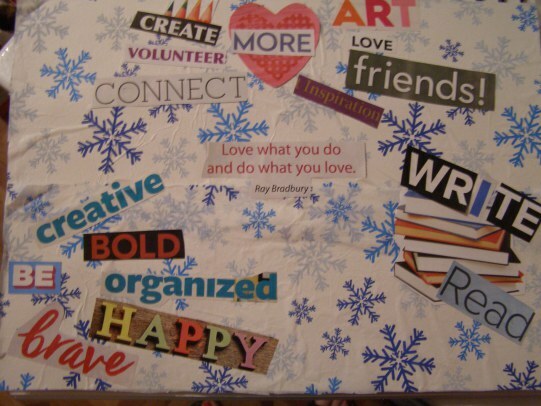 With the full moon on Jan. , I created a dreamboard for the month ahead. The theme this week is "Childhood"
The theme this week is "New Beginnings"
The theme for January is "New Year, New Adventures". This quote by Neil Gaiman encourages us to make glorious mistakes - and can apply to writing or art. A wonderful freeing way to start the new year. 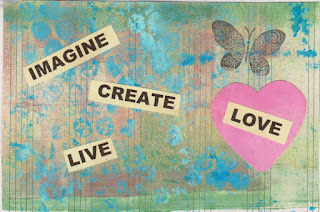 This week I played with my gelli plate - something I haven't done in a while. 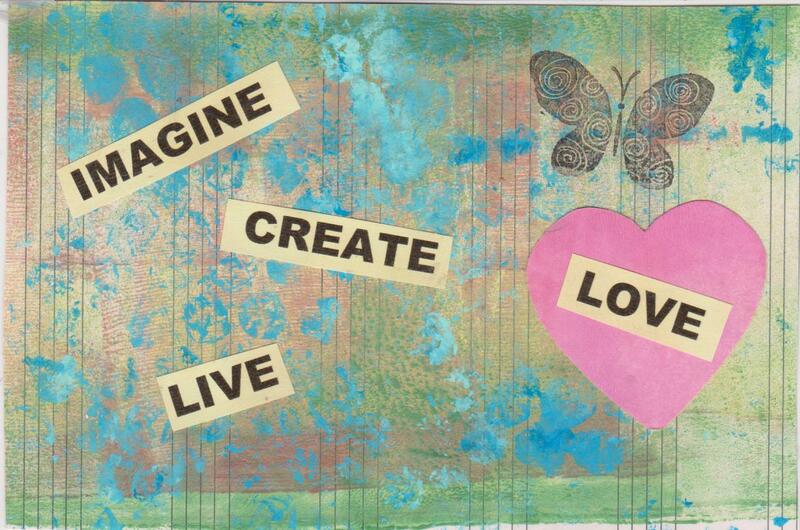 I used my bigger new plate and created some papers for backgrounds, using some new stencils I got before Christmas. I will definitely have to do more of that. I may not have created every day, but I am creating more having fun doing it! What wise words you have chosen. I loved your word of the year, and of course, your advice to not get hung up when you make a mistake. I really think this quote should be plastered on every artist's forehead, because, even though we have doubts, we still have to learn to accept and appreciate our mistakes. 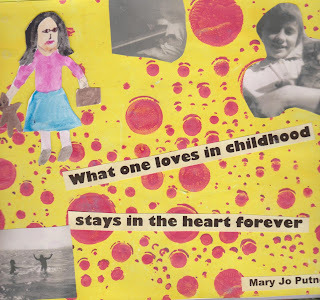 Thanks for sharing this (and your other glorious art) today at Art Journal Journey. Your art is fantastic Bev. I love your use of words on all of your pieces. And what really speakes to me is this "Mistakes" page - something that I should take as an advice for me too! Thank you very much for being with us at Art Journal Journey ! 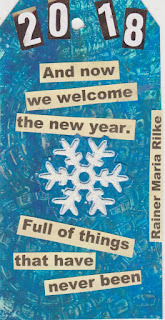 I hope to see you more often this year again with your wonderful Journaling art! Your participation is much appreciated! I like your idea to cut out words and make a new page with them! To make glorious mistakes is really a freeying way for new art! 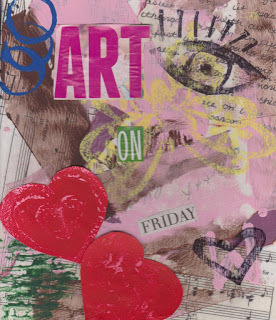 Your gelli-prints are beautiful! What a great and creative new year you are beginning Bev! Each one of your projects is just fab- so uplifting. Great quote. And I really need to get my plate out and play- I am almost out of all the prints I made on deli papers. Happy PPF and a happy New Year too! 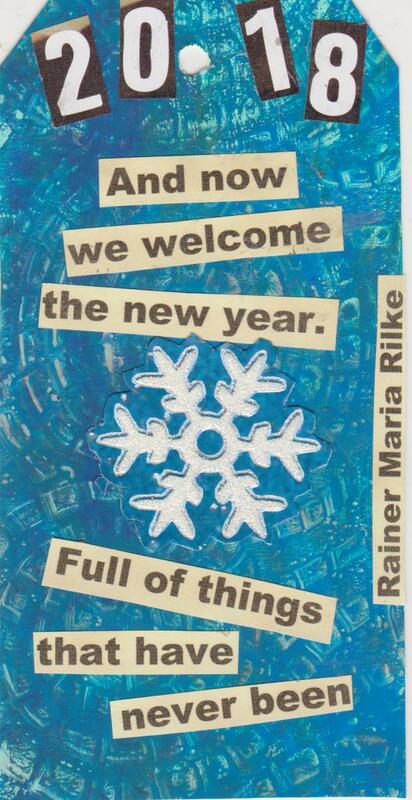 You are certainly off to a creative new year! Love my visits to your creative space!! I think you are off to a great start with your OLW, lol Loving all the art, keep it up! Thanks for sharing your art with us at #BloggersPitStop and wishing you happiness and health for 2018. Wonderful art as always. The tag is fantastic.